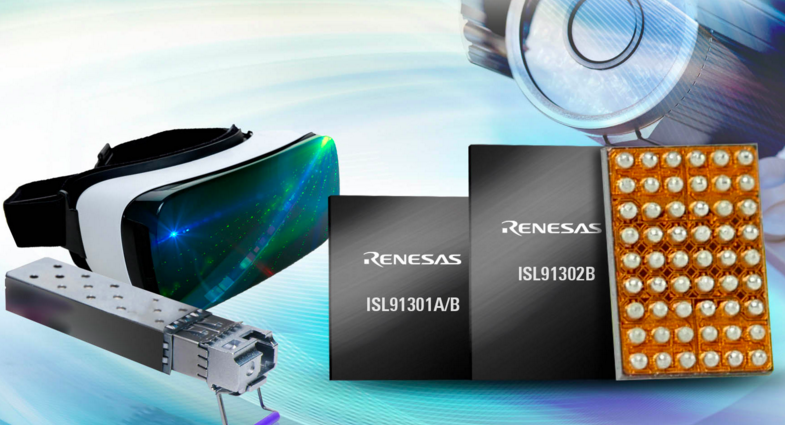 Renesas Electronics has announced three programmable power management ICs (PMICs) that offer the highest power efficiency and smallest footprint for application processors in smartphones and tablets: the ISL91302B, ISL91301A and ISL91301B PMICs. The PMICs also deliver power to artificial intelligence (AI) processors, FPGAs and industrial microprocessors (MPUs), and they are ideal for powering the supply rails in solid-state drives (SSDs), optical transceivers, and a wide range of consumer, industrial and networking devices. The ISL91302B dual/single output, multiphase PMIC provides up to 20A of output current and 94% peak efficiency in a 70mm2 solution size that is more than 40% smaller than some competitive PMICs. In addition to the ISL91302B, Renesas’ ISL91301A triple output PMIC and ISL91301B quad output PMIC both deliver up to 16A of output power with 94% peak efficiency. The new programmable PMICs leverage Renesas’ R5 Modulation Technology to provide fast single-cycle transient response, digitally tuned compensation, and ultra-high 6 megahertz (MHz) (max) switching frequency during load transients. These features make it easier for power supply designers to design boards with 2mm x 2mm, 1mm low profile inductors, small capacitors, and only a few passive components.